. It’s a versatile sauce that’s pure parsley, with a hit of garlic to make what might otherwise be an austere sauce a little more homey. It’s good with white meats and fish, and the color is so vivid it almost looks like paint. In a good way. Pheasant breasts, as well as the breasts of quail, turkey, partridges and good chickens should all be served at a solid medium. So should the saddle of a rabbit. I know this runs counter to what many people think. But seriously, you want the center to be no hotter than 155°F after resting, and even 145° after resting is fine; the pheasant in the picture was seared to 140°F and then rested for 5 minutes. The visual key is a blush of pink. If you do this, you will be rewarded with the most tender pheasant you’ve ever eaten. Follow my searing instructions below and you won’t be sad. I like to make the parsley sauce the star here, so I don’t clutter up the plate with too many other flavors. 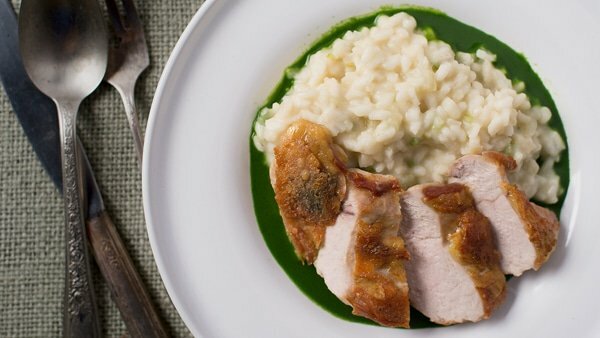 Mashed potatoes is your ideal easy side dish, but a simple risotto made with pheasant broth from the carcasses of your birds is even better. Regular rice is OK, too. This sauce requires a little work, but you will be rewarded with a stunning sauce that's probably not like anything else you've ever eaten. Once you make it, you can use the technique for lots of other herbs, such as basil, tarragon, cilantro, young oregano and marjoram. The searing technique in this recipe is a little unorthodox, but if you let the pheasant come to room temperature before you start it works well. The result is perfectly tender pheasant with just a blush of pink in the center, topped with skin so crispy it's like a cracker. Take the pheasant breasts out of the fridge and salt them well. Let them rest at room temperature for 30 minutes while you make the parsley sauce. To make the sauce, start by bringing a large pot of heavily salted water (it should taste like the sea) to a rolling boil. Dunk the parsley and garlic chives in for about 15 to 20 seconds; if the parsley is old, boil for 30 seconds. Remove and submerge in a bowl of ice water to cool. Roughly chop the greens and put them in a blender. Add about 1/4 cup of water and puree. Scrape down the sides of the blender if you need to get all the debris smoothly pureed. Scrape all of the puree into a fine-meshed sieve set over a bowl. Let it drain for a few minutes. Remove this liquid and reserve it in a little bowl or dish. Push the puree through the sieve with a plastic spatula. This will take some doing. Keep at it until the puree left in the sieve is dry looking. From time to time, scrape off the “good stuff” on the other side of the sieve and let it fall into your bowl. This whole process often takes up to 15 minutes of turning, scraping and pushing, turning, scraping and pushing. You now have your base for the sauce. This can all be done a day ahead; if you store the sauce base, keep it in the fridge tightly covered. To sear the pheasant, first pat it dry with paper towels. Heat the canola or grapeseed oil in a saute pan set over medium-high heat. When the butter is hot, lay the pheasant breast skin side down in the pan -- or on the side where the skin used to be. Sear undisturbed for 2 minutes, pressing down on the breasts with a spatula to make sure the skin gets even contact with the pan. After it has cooked for 2 minutes, add the butter and when it melts, use a large spoon to baste the hot oil/butter over the breast. Do this repeatedly while the skin side sears. 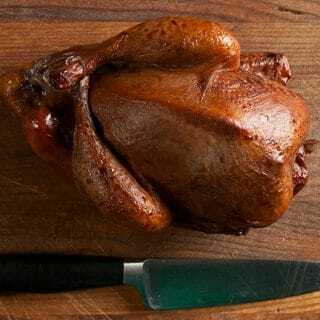 Use the finger test for doneness to test the pheasant: You want it to be medium, or about 145°F to 150°F. This should take about 8 to 10 minutes. Move the pheasant to a cutting board to rest, skin side up. To finish, put the sauce base in a small pot. Heat until steaming, making sure to not let the sauce even simmer, let alone boil. Add salt to taste, then swirl in 2 tablespoons of butter, one at a time. 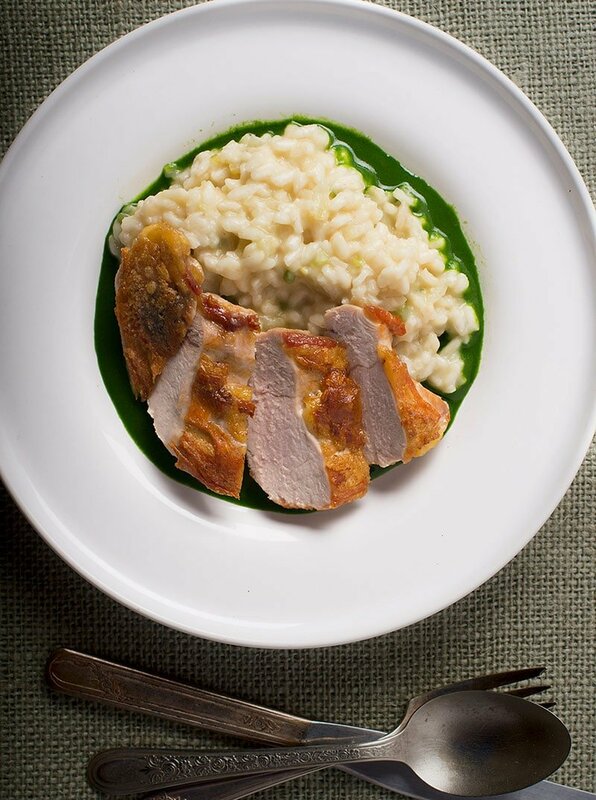 Pour some sauce in a pool on the plate and top with the pheasant breast, skin side up. Serve at once with risotto, bread or mashed potatoes. I have tons of pheasant recipes, as well as recipes for all kinds of upland game, here on Hunter Angler Gardener Cook! Brennan: You use the liquid to thin the parsley sauce as needed.